The Winco FC-PL Plastic Flatware Cylinder has a 4.25" diameter with an outer lip so it can fit easily into standard size flatware cylinder holders. 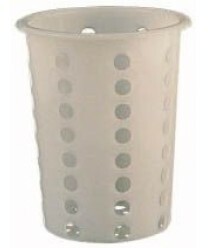 Made of sturdy plastic with many large perforations, flatware will be aerated and dry and ready for use as needed. Dimensions:4.2" x 4.2" x 5.1"
Winco MXB-1300Q Stainless Steel Mixing Bowl 13 Qt.